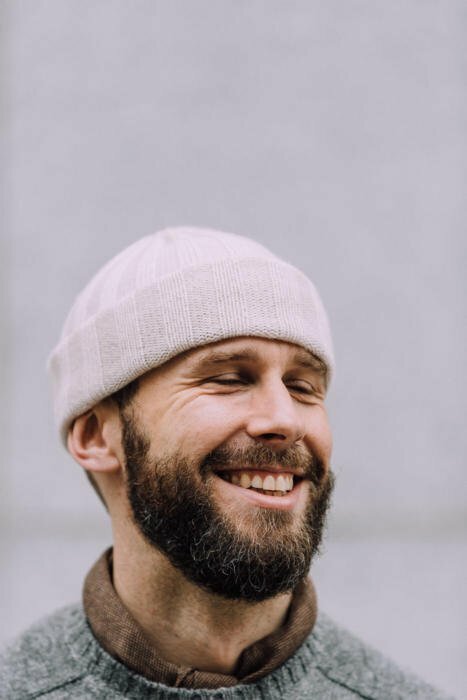 I'm pleased to say the Permanent Style watch caps are finally available again - on the shop site - after some delays. The nice thing about cream, for me, is its versatility. Just like cream trousers, a cream hat goes with every other colour, from smart greys and navy to casual browns and greens. I'm wearing it here with my Armoury x Real McCoy's horsehide jacket, but it looks equally good with my navy Cifonelli overcoat, for example. It's also quite a de-saturated cream, almost off-white, which I find makes it feel a little more casual and not as luxe. For those not familiar with the story, this hat re-creates the design of a pair I bought at a small shop in Naples years ago. 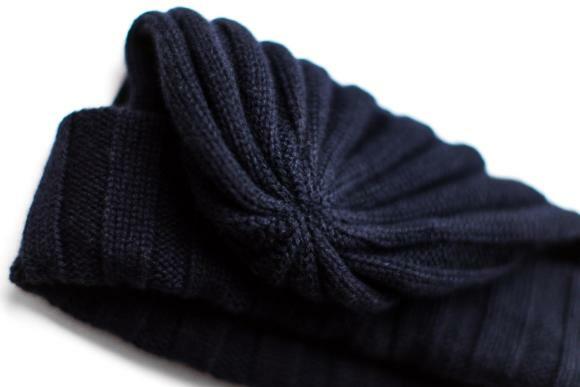 They're smaller than other cashmere beanies, which means they can sit higher on the head and look smarter as a result. 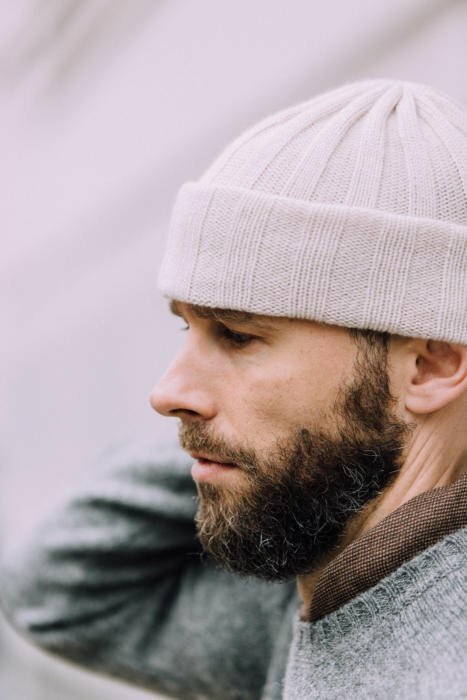 Personally I find most cashmere hats like this are too big, covering the whole head from neck to eyebrows. That's warmer, but looks very casual and ill-suited to tailoring. These, by contrast, look great with a sharp overcoat - which is particularly useful for those that don't like wearing brimmed hats or a flat cap. Among the make points are tighter knitting and flatter pressing, both of which emphasise the clean look. You can read the full back story on the original launch post here. The style is one I shamelessly stole from certain Japanese gentlemen, but found hard to replicate with any other hats. Hence the spur for the collaboration. The look means wearing the hat low on the front of the head, but then almost horizontal to the back. It's something you see more with wool hats from workwear brands - hence the watch-cap reference. You can, of course, wear it any way you want though. 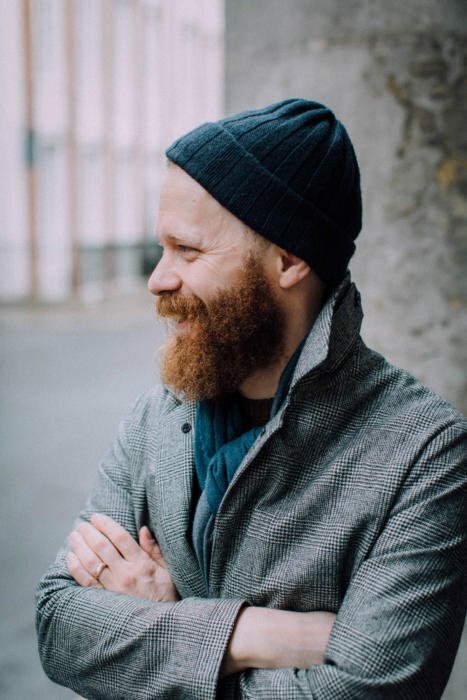 Jamie (Ferguson, photographer) wears his PS Watch Cap pushed way back on the head (below). I find this too casual for what I wear, and seems to really emphasise my baldness for some reason - not a problem Jamie has. Interestingly, though, Jamie also says he finds most hats too big, and ill-suited to wearing in this style as well. Another small design aspect of the hats is that we fold them up, twice, and sew them down in this position. It replicates something I did by hand with my original pair. The hats cost £65 (ex-VAT) and are available on the shop site now - shipping immediately. You can follow the discussion on Watch Caps back in stock – in navy and cream by entering your email address in the box below. You will then receive an email every time a new comment is added. These will also contain a link to a page where you can stop the alerts, and remove all of your related data from the site. Hi Simon, great news the hats being back in stock. Will order the cream asap. Furthermore, what do you think about olive green as a third/fourth option, should one already have the other two options offered here previously? Wondering if you could put up some long shots of you wearing the gray sweater with the brown square scarf and cream cap? I’m struggling a little to see how the cream cap looks with the full outfit since you only have close-ups for that. 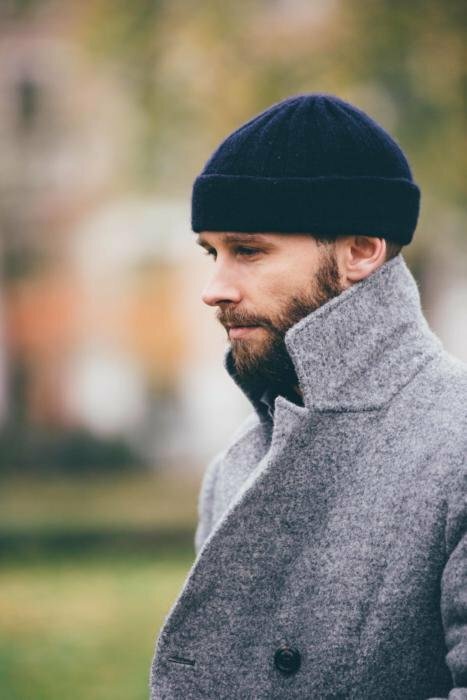 I bought the navy cap last year and have come to find it very useful, but not always ideal to wear with my navy peacoat casually when everything matches too much. I’m not sure the cream though is going to work and it might be a bit too striking as compared to last years’ gray. The long shot photo might help reassure me somewhat. 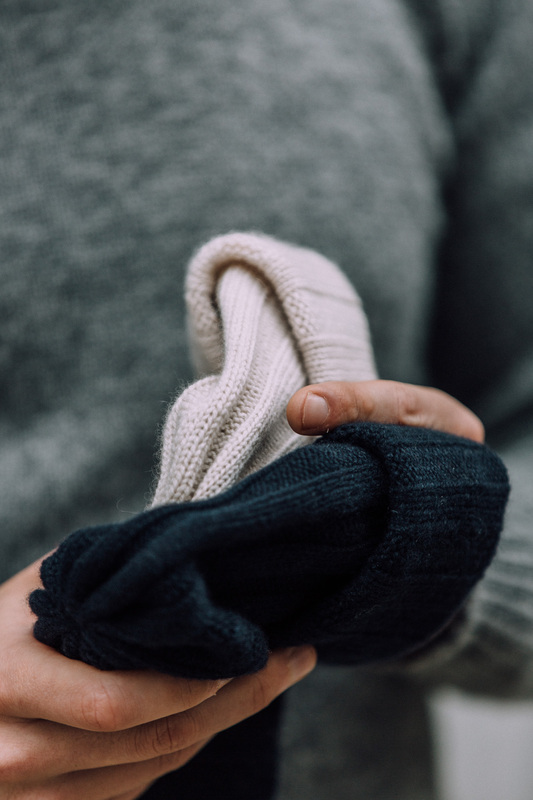 I don’t have one I’m afraid, sorry about that… For what it’s worth, I like navy or navy for these kind of accessories, and find cream works in as many outfits as grey – more sometimes, as grey on grey is a more difficult look, given the shades are likely to be slightly different. The only thing grey has over cream is that the latter is a little more striking and unusual. I suppose this is only tangentially related to the topic of the post… However, it seems to me that there is a huge gap in the market in London in the absence of a good-quality multi-brand store. NYC has the armoury, NMWA, Bergdorf, Barneys to name a few. The only store which jumps to mind in London is Trunk (please, please tell me if I’m missing something). The continent has a wide array of small boutiques selling good-quality clothing (your city guides are a testament to this). Why then does London, which has huge superstores such as Selfridges and Harrods lack in clothing beyond the usual boring gucci, purple label, tom ford etc type brands? In general, bigger cities don’t have these multi-brand stores as much because of the big department stores, and because many of the brands have their own stores. That’s generally why there are so many in Italy and Germany for instance (having multiple major cities helps as well). New York doesn’t have that many compared to those cities, but there are fewer in London than in New York. I think this is largely because London is actually not that big a market – compared to New York as a US hub – which is why so many Italian brands can be found in Tokyo and New York, but not in London (we never see the likes of Attolini, Belvest, Stile Latino etc). Also the market that London has developed for itself is uber-rich, from Russia, Asia or the Middle East, who generally still favour those bigger brands. Fenwick in London has a good range (Ring jacket and Frank Clegg amongst the highlights) and seems to go under the radar. Richard Gelding is a store I walked into by accident noticing the Carmina shoes in the window a couple of weeks ago and I have to say I was surprised at how good the selection of brands was – they’re actually much more than just a Canali Suits stockist which is what they sell themselves as. They were, funnily enough, the only place in London that I’ve seen Frank Clegg bags. Although the service was a bit rustic. Very good point H, and thanks for highlighting Richard Gelding, I had forgotten to do that. So 6 ply by conventional parlance? Curious why you don’t actively market this fact? Generally because it varies less with hats and is less commonly referenced. But we should include it – I’ll add it to the product description now. Thanks for this Simon – quick question: from where is the grey wool jumper in the first three and last photos? Looks like a classic Scottish lambswool but would love to know the maker. No, the whole point is to keep warm. And I’m perfectly warm like this. Definitely makes it a “city” hat though. You can’t go for a windy walk along Dorset coast with nothing over ears this time of ear. Generally fair to say, i think, Simon that you are an urban dresser with metropolitan salutes to rural style / practicality? Generally the finess of urban clothes over rural probably comes down to 2 things, wealth and practicality! Living in Canada, I was a bit wary this cap would be useful. And it isn’t during most of the winter. But I’ve found it actually is quite a useful accessory for the transitional seasons or warm winter days. Days when I’d perhaps reach for a flat cap to keep my head a little warmer for comfort, but when it isn’t cold enough to need ear covering. This cap has given me an alternative to going to a hat, and added some variety to the wardrobe. For us who get cold winters, I think we need to recalibrate the use of this cap–it isn’t for what we consider cold weather, but rather for cooler weather. Good quality watch-cap style but prefer the cuff-less beanie. Really not sold on cream though, something not quite right about it (a bit feminine as beanies have a workwear/military influence, neither of which would ever use cream…). 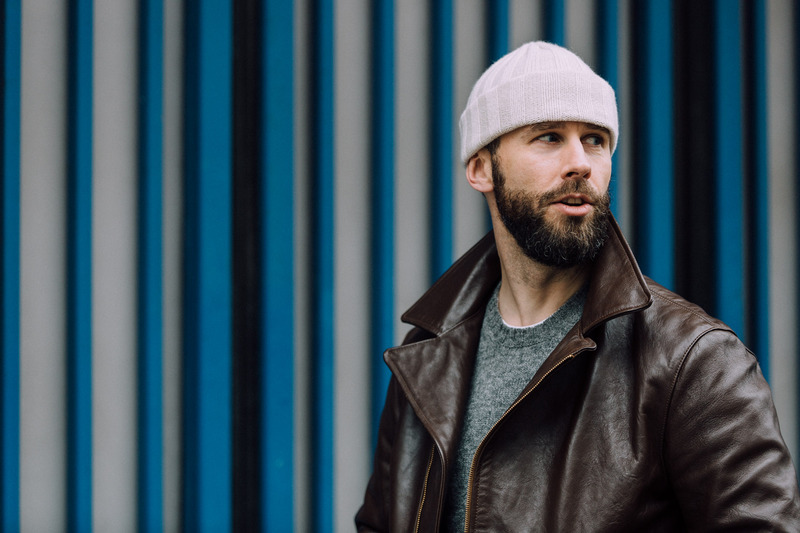 Prefer to see olive, grey, black, burgundy, camel, red and orange (for casual style)…Here is a link to the history of said cap. Interestingly it is usually worn in one of two ways, pushed back at an angle or straight with the cuff above the ears. 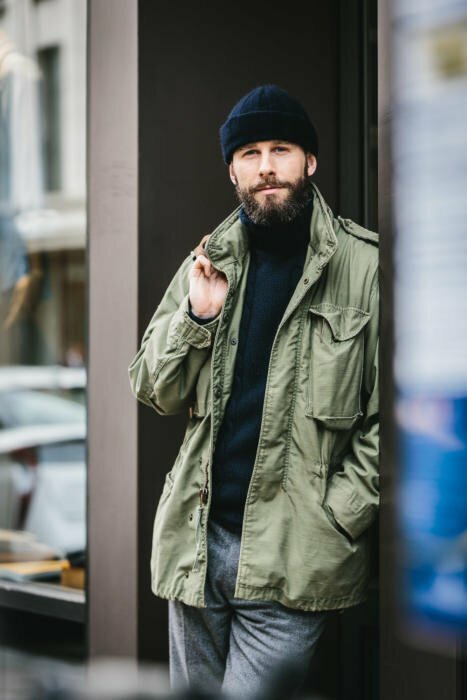 What trousers (brown/tan) are you wearing in the photo for this article on the main page (not in the article page)? As you know, I bought the cream watch cap, have you considered doing them in Camel, toffee and black?